UN Under-Secretary-General for Humanitarian Affairs and Emergency Relief Coordinator Stephen O'Brien during a visit to Afghanistan on 7 September 2016. Seeking $150 million for aid efforts in Afghanistan, the top United Nations relief official today called on the international community to urgently scale up its support for the war-torn country so that it can meet the rising humanitarian needs of more than one million people who are on the move, either internally displaced or returning from neighbouring countries. “Now more than ever the international community must remain steadfast in support of the people of Afghanistan to provide for displaced families, new returnees and work to tackle the alarming malnutrition crisis to prevent more than 126,000 children from dying this year,” the Under-Secretary-General for Humanitarian Affairs and Emergency Relief Coordinator, Stephen O'Brien, told a news conference in the Afghan capital of Kabul as he concluded his two-day visit to the country, according to a news release from the UN Office for the Coordination of Humanitarian Affairs (OCHA), which Mr. O'Brien heads. OCHA resumed its operations in Afghanistan in 2009, providing humanitarian assistance in a complex environment where separate – and not always complementary – military, political and security objectives pose challenges to the implementation of humanitarian principles, the ability of responders to reach people in need and the safety and security of aid workers. In addition to being prone to recurrent natural disasters, Afghanistan has been in protracted conflict for almost 35 years, which has seriously hampered poverty reduction and development, strained the fabric of society and depleted its coping mechanisms. According to OCHA, Afghanistan is facing a humanitarian crisis as highly vulnerable families will experience the severity of the upcoming Afghan winter, many for the first time. Also, currently, more than 1.1 million people have been displaced from their homes by the country's conflict, including roughly 245,000 this year alone. At the same time, more than 5,000 displaced Afghans are returning from Pakistan every day. UN Emergency Relief Coordinator, Stephen O'Brien, has urged the donor community to contribute around $150 million to respond to the escalating humanitarian needs of more than 1.1 million people, displaced by conflict in Afghanistan over the last 15 years. As a result of this sudden influx of returnees, OCHA and its humanitarian partners in Afghanistan will launch a so-called Flash Appeal requesting around $150 million to support the humanitarian response to meet the needs of the spike in numbers of new people on the move. A Flash Appeal occurs within the context of any major sudden onset disaster that requires a coordinated response beyond the capacity of the government plus any single UN agency to respond to, and it outlines specific response plans to address acute humanitarian needs, normally for up to six months. “We are asking our donors for around $150 million to respond to the urgent lifesaving needs for the next four months,” Mr. O'Brien told the news conference. “As we implement our response plan, the government is preparing plans for longer-terms solutions for the resettlement of returnees. As the conflict continues with nearly a quarter of a million people displaced this year alone, the humanitarian and the protection of civilian needs are increasing and access constraints have escalated. “The United Nations and our humanitarian partners are ready to scale up the response. But we urgently need international support and funding,” the OCHA chief said. “I commend the international community for their engagement and encourage all donors to continue to stand by the people of Afghanistan to provide practical hope for the future. The UN official also warned that widespread malnutrition, which he described as “a silent humanitarian emergency,” claims more lives of children than the current conflict in Afghanistan, citing OCHA's statistics which show 2.7 million people affected by alarming levels of malnutrition, including a million children under the age of five. Only 35 per cent of children with severe acute malnutrition are being reached and, of those, only 25 per cent are actually cured. “More must be done to alleviate children's suffering and protect them from dying,” said Mr. O'Brien, who also called on governments and other stakeholders to commit to saving lives through better health care services and tackling malnutrition. 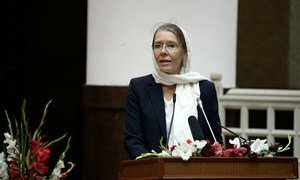 In his remarks to the news conference, the UN relief chief also voiced concern over the safety of aid workers in Afghanistan, noting that 93 of them have been abducted since the beginning of 2016. He said that all parties to the country's conflict are obliged to uphold the principles of international humanitarian law and ensure the protection of civilians and aid workers. While in Afghanistan, the UN relief chief met with humanitarian partners, government officials and the diplomatic community, and visited displaced families affected by the country's ongoing conflict. The United Nations’ mission in Afghanistan has condemned last night’s attack on a university in the capital, Kabul, that killed 12 civilians and injured more than 50 others, mostly students.